(Minghui.org) Tailai Prison has intensified its persecution of detained Falun Gong practitioners since November 2015, when a new mandate was issued to specifically target practitioners who refuse to give up their belief. 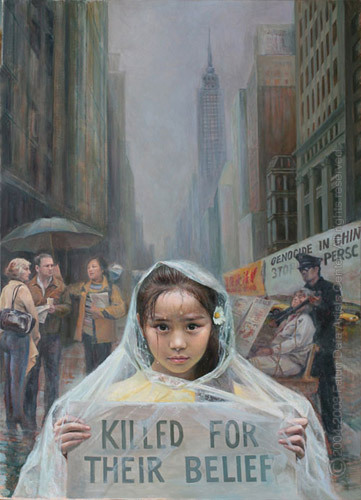 As no law in China criminalizes Falun Gong, the imprisoned practitioners never considered themselves criminals and thus refused to take part in forced labor. Their peaceful protest against the false imprisonment was met with this new mandate. (Minghui.org) The Tian Guo Marching Band, which is made up of Falun Gong practitioners, was chosen to the lead the grand parade at an annual cultural festival held in Kaohsiung, Taiwan, November 19 and 20. In conjunction with the Matsu Festival in Gangshan, the event also celebrated the screw production in this region—about one-sixth of the industry’s total production globally. Nearly 100 groups and 10,000 spectators participated in the festivities. (Minghui.org) On October 29, 2016, a prominent community leader received a big welcome at the Falun Dafa practice site on the Gold Coast, Queensland. Michael Kaff, who recently ran as an independent candidate for the Australian Senate, continues to be very supportive of Falun Dafa and has taken every opportunity to raise awareness of the horrifying reality that the Chinese Communist Party (CCP) is killing Dafa practitioners, Tibetans, underground Christians, and Uyghurs for their organs for profit in China. Mr. Kaff showed his support for the fundamental freedom to practice Falun Dafa, without fear of persecution or organ harvesting, by attending the weekly practice site at Harley Park, Labrador. He learned all five exercises – the four standing ones and the sitting meditation. (Minghui.org) A Dalian City resident was tried two days after her son, a resident of Washington, D.C., called for her unconditional release in front of the Chinese Embassy. Some of her supporters were also arrested for trying to attend her trial in Dalian. Ms. Yuan Xiaoman was seized from home on May 12, 2016 for filing a criminal complaint against former Chinese dictator Jiang Zemin for ordering the persecution of Falun Gong that resulted in her family’s ordeal. Ms. Yuan, her husband, and their son practice Falun Gong, a spiritual discipline based on the principles of Truthfulness-Compassion-Forbearance. The couple had been repeatedly arrested and tortured for their faith since the persecution began in 1999. Their son, Mr. Du Haiqing, later moved to the U.S. to escape the persecution. (Minghui.org) For many years, Falun Dafa (also known as Falun Gong) has been a welcome component of holiday festivities around the world. As the winter holiday season approaches, Canadian Falun Dafa practitioners have recently participated in two local Santa Claus parades, one in London, Ontario and another in Winnipeg, Manitoba. (Minghui.org) Falun Gong practitioners in New York held a parade through the Chinese community in Brooklyn on November 11, 2016. Led by the Tian Guo Marching Band, the 500-person procession highlighted the health and mental benefits of the spiritual practice and raised awareness of the ongoing persecution of Falun Gong in China. Their musical performances and banners attracted a large crowd. (Minghui.org) The Bleeding Edge, a film exposing China’s state-sanctioned organ harvesting from living Falun Gong practitioners, was shown as part of the Vancouver Asian Film Festival (VAFF) on November 5, 2016. The film is a narrative feature by award-winning Vancouver-based director Leon Lee, who won a Peabody Award in 2015 for his documentary Human Harvest about the horrors of forced organ harvesting in China. The Bleeding Edge stars actress Anastasia Lin, winner of Miss World Canada 2015.